You'll spend your first night at The Brehon or Trim Castle Hotel, and set off riding the next day. Note: If you require additional nights before or at the end of one of our Tours, just let us know in the Special requirements field at the end of the form and we'll be happy to arrange this for you. Please choose your preferred motorcycle. If your 1st preference is not available we will allocate you this bike instead. If your 1st preference is not available, we will allocate you this bike instead. 1 Contract with Lemonrock Bike Tours. 1.1 By signing this contract, you accept these Rental Terms and Conditions as part of the binding contract between Ireland Rider Motorcycle Rental Limited trading as Lemonrock Bike Tours (hereafter known as “Lemonrock Bike Tours”) and you, the motorcycle renter, (hereafter known as the “Customer”). 1.2 Lemonrock Bike Tours cannot accept any Customer without a signed Rental Terms and Conditions contract. 2.1 The Customer will have the motorcycle for the rental period specified in the rental contract. If the Customer does not return the motorcycle on time, he/she is breaching the conditions of the rental contract. Lemonrock Bike Tours reserves the right to charge the full daily rental rate if the motorcycle is returned later than agreed on the rental contract. 3.1 Our hours of business are from 09:00hrs to 17:00hrs, Monday to Saturday. Sunday opening may be accommodated by prior arrangement in certain circumstances. 4.1 Rental rates quoted by Lemonrock Bike Tours on www.Lemonrock Bike Tours.com or printed materials are those in effect at time of writing. Lemonrock Bike Tours will maintain rates for motorcycle rental as confirmed at time of booking. 5.1 All Customers must have a valid credit card (MasterCard or Visa) with a credit limit to cover the rental cost and preauthorised damage deposit at the time of collection of the motorcycle. 5.2 Customers are responsible for the cost of any damage to or theft of the motorcycle, accessories and riding gear while in their care to the limit of €2,500 which can be reduced by purchasing additional optional waivers. supplied correct information at time of rental. obeyed the rules of the Irish Road Traffic Act. 6.1 For any motorcycle reservation, a reservation deposit is required at the time of booking. The reservation deposit is 30% of the rental cost and secures the motorcycle. 6.2 The model of motorcycle will be as defined in the rental contract. The pictures and descriptions of the motorcycles on www.LemonrockBikeTours.com and any printed material issued by Lemonrock Bike Tours are representative of the available motorcycles but are not necessarily the specific motorcycles. Lemonrock Bike Tours reserves the right to correct online and printing errors at any time. 6.3 Lemonrock Bike Tours aims to ensure that Customers ride the motorcycle which they have booked. Unfortunately, unexpected and uncontrollable situations can arise which may require the substitution of a motorcycle. This includes, but is not limited to mechanical failure, collision damage and theft. If such a situation arises before rental, the Customer will be provided with a comparable replacement motorcycle. If a comparable replacement motorcycle is not available, the customer will have the option to terminate the contract and shall be entitled to a full refund of any booking deposit. 7.1 The Customer and Lemonrock Bike Tours will jointly check the condition of the motorcycle and tyres before signing the rental contract. Having accepted the condition of the motorcycle and tyres, the Customer cannot make Lemonrock Bike Tours liable for any damages resulting from a tyre puncture. 7.2 The Customer shall assume all fuel costs. The motorcycle will be supplied with a full tank of fuel and should be returned full. A refuelling charge will apply unless returned with a full tank. 7.3 The rental includes normal tyre wear and tear. The rental does not cover abusive tyre treatment by the Customer. Tyre punctures and the resulting costs are the responsibility of the Customer. 7.4 The Customer agrees to return the motorcycle in the same condition, both in terms of its working condition and its overall appearance. 8.1 In addition to holding a valid motorcycle driving license, the Customer confirms that they have the relevant competence and experience to ride a motorcycle of the type they are renting. 8.2 We want you to enjoy a safe motorcycling experience with Lemonrock Bike Tours, so Customers must ensure that they ride safely and sensibly and take extra precautions to account for riding conditions, especially if riding an unfamiliar model or on unfamiliar roads. 8.3 To avoid theft, the Customer must keep the keys to the motorcycle in their possession at all times… The Customer shall leave the motorcycle only in secured parking areas and must use all security devices fitted to and supplied with the motorcycle. 8.4 The Customer must make sure to use the correct fuel and engine oil for the motorcycle. Damage incurred due to incorrect fuelling or engine oil will be the responsibility of the Customer and is not covered under the Collision Damage Waiver option. 8.5 The Customer must not sell, rent or dispose of the motorcycle or any of its parts. 8.6 The Customer must notify Lemonrock Bike Tours without delay when he/she becomes aware of a fault in the motorcycle, including any warning lights, before riding any further. The Customer must not, or allow any third party, carry out repairs or any mechanical work on the motorcycle without the permission of Lemonrock Bike Tours. If Lemonrock Bike Tours gives the Customer permission, Lemonrock Bike Tours will only give the Customer a refund if the Customer has a valid receipt for the work. 8.7 For rental periods over a week or 2000km, the Customer shall conduct basic checks every 1000km (i.e. oil & coolant level, tyre pressure, chain tension & grease). 8.8 The Customer must comply with passport, visa, driving and health regulations and all consequences resulting from non-compliance shall be the Customer’s sole responsibility. 8.9 Lemonrock Bike Tours strongly recommends that all Customers carry valid travel insurance. 8.10 The Customer must comply with national traffic laws and regulations. 8.11 It is compulsory for the rider and pillion to wear a motorcycle helmet while riding at all times. Customers will be provided, free of charge, with a good quality helmet that adheres to all Irish legislative requirements. If the customer wishes to wear their own helmet, they should satisfy themselves that the helmet conforms with the requirements of Irish law. 9.1 Lemonrock Bike Tours will have maintained the motorcycle to at least the manufacturer’s recommended standard. Lemonrock Bike Tours assures the Customer that the motorcycle is in roadworthy condition and suitable for renting at the start of the rental period. 10.1 Lemonrock Bike Tours will charge the Customer the total rental charge before the start of the rental period. Upon hand-over of the motorcycle, Lemonrock Bike Tours will ask for authority from the Customer’s credit card company for the damage deposit. 10.2 If the motorcycle is returned undamaged and no damage has been caused to anybody else’s property whilst renting the motorcycle, the damage deposit will not be charged to the Customer’s credit card. 10.3 If the motorcycle is returned damaged or with parts missing, the damage deposit shall be forfeited in part or in full by Lemonrock Bike Tours at its sole discretion. In addition, a €50 administration charge applies to all damages or missing parts. The rental and any other agreed charges as may be offered by Lemonrock Bike Tours to the customer. The amount of any loss or damage resulting from the Customer not keeping to his/her responsibilities. All fines and court costs for parking, traffic or other offences. The Customer must pay the appropriate authority any fines and costs if and when the authority demands this payment. Outstanding charges will be deducted from your credit and an additional €50 administration fee per item will apply. All legal fees or court costs incurred by Lemonrock Bike Tours in the collection of these charges. 11.2 Lemonrock Bike Tours strongly recommends that all Customers and their pillion passengers be covered by adequate personal, accident and medical insurance valid in Ireland. 11.3 For the Customer’s safety, Lemonrock Bike Tours strongly recommends that suitable clothing such as motorcycle jackets, trousers, leathers, gloves, boots, etc. are worn. Motorcycle clothing is available for rent from Lemonrock Bike Tours. 11.4 Lemonrock Bike Tours is not liable to the Customer, pillion passenger, his property, his family, heirs or assigns for any damages arising from the acts of the Customer which might result in injury, death or other damage. 11.5 Pillion are also permitted to ride the motorcycle once they have agreed with Lemonrock Bike Tours before departure and on production of a valid driving license and have signed the rental agreement form. Any rider wishing to carry a pillion passenger must be 30 + years of age at the date of riding the bike. The Customer must produce his/her current original driving licence before commencing a rental. Provide correct information as otherwise in the event of damage to the motorcycle or a road traffic accident, you will lose your damage waiver cover and may be subject to prosecution. Who has been banned from driving in the past 5 years. Who has more than two minor driving offences in the past three years. Who has made more than one claim in the past three years. Who has been convicted of any criminal offences which aren’t considered ‘spent’ or has any pending prosecutions. Who has had insurance declined, voided or cancelled or special terms imposed. Who is employed or works within the Sport or Entertainment industries. 12.3 Lemonrock Bike Tours rental motorcycles shall be driven exclusively by the riders who appear on the rental contract. The motorcycle is non-transferable. It is valid only for the period and persons specified in the rental contract. Use the motorcycle for any illegal purpose. Use the motorcycle if he/she may reasonably be considered unfit to drive. Use the motorcycle whilst under the influence of alcohol or drugs. Use the motorcycle for racing, speed testing or teaching to drive. Use the motorcycle for carrying fare-paying passengers. Use the motorcycle off-road or on racetracks. 13.1 In the case of the motorcycle’s theft or any non-cosmetic damage, the Customer agrees to inform Lemonrock Bike Tours without delay and no later than 3 hours of the incident. 13.2 If the motorcycle is involved in an accident, the Customer must not admit responsibility. The Customer should get names and addresses of everyone involved including witnesses and if possible, take photographs of the scene. The Customer should also make the motorcycle secure and tell the police (Garda Siochana in Republic of Ireland / PSNI in Northern Ireland) without delay if anyone is injured or if there is a disagreement over who is responsible. 13.3 The customer and pillion (if appropriate) will co-operate with any reasonable request from Lemonrock or its insurers to provide statements and other information in respect of the accident when required at any time. 13.4 The Customer agrees to inform Lemonrock Bike Tours without delay and no later than 24 hours of the accident. The Customer shall send Lemonrock Bike Tours by registered mail a copy of the jointly filed accident report as well as a written declaration describing the circumstances of the accident and the identity of the parties involved in the accident. 13.5 Lemonrock will provide a replacement motorcycle or arrange for repair in the event of a breakdown, caused through no fault of the customer. However, Lemonrock does not provide a replacement motorcycle in the event of an accident or breakdown caused by the customer. 13.6 Motorcycles come with breakdown cover. In the event of breakdown, the Customer agrees to inform Lemonrock Bike Tours without delay and no later than 24h. 14.1 Lemonrock Bike Tours provides rental equipment such as navigation systems, motorcycle luggage and helmets. Any missing or damaged equipment supplied by Lemonrock Bike Tours to the Customer will be paid at current replacement value for by the Customer. 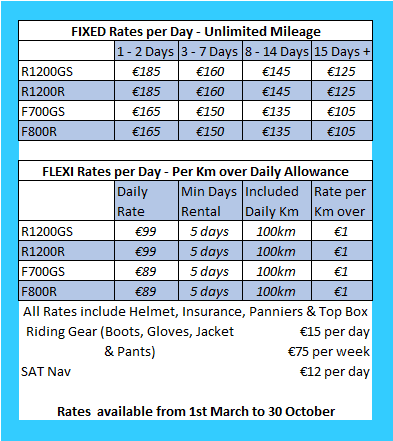 14.2 Rentals start and finish at Lemonrock Bike Tours in Killarney Ireland or at our Trim Castle location. One-way rental options are available for an additional fee. 15.1 Cancellations by the Customer up to 90 days prior to the rental will be subject to a 10% cancellation fee. If the Customer cancels the agreement less than 90 days prior to rental, Lemonrock Bike Tours shall retain the reservation deposit. 15.2 In case of cancellation by Lemonrock Bike Tours, any Customer payment will be totally refunded, or the booking moved to a later date with the Customer’s agreement. 15.3 Lemonrock Bike Tours is not required to make refunds once rental commences regardless of the reason for Customers being unable to complete his or her rental. Lemonrock Bike Tours cannot be made liable for unpleasant or unsuitable weather conditions and no refunds are made for such conditions. Does not sign the Rental Terms and Conditions contract. Does not provide an appropriate driving licence. Does not authorise his credit card company for the damage deposit and the rental charges. 16.2 Failure to fulfil the above conditions gives Lemonrock Bike Tours the right to keep the reservation deposit plus a €50 cancellation fee by the Customer. Abuse of the motorcycle by the customer, e.g. burnouts, wheelies, etc. Road Traffic Accident or damage to the motorcycle which renders it unsafe to ride. 16.4 In case of termination of the contract, Lemonrock Bike Tours will secure the provided motorcycle immediately. Pick-up costs of €2 per kilometre, a €50 contract termination fee plus any required mechanical repairs to the motorcycle will be charged to the customer’s credit card. 17.1 Verbal changes of contract are invalid unless confirmed in writing by Lemonrock Bike Tours. Should any parts of the Rental Terms & Conditions become invalid, this does not invalidate the remainder of the contract. 18.1 Any photographic material produced by Lemonrock Bike Tours or its representatives are the property of Lemonrock Bike Tours. The copyright remains with Lemonrock Bike Tours. Lemonrock Bike Tours can use all of this material for advertising and marketing purposes without any charge from the Customer arising for Lemonrock Bike Tours. 18.2 Lemonrock Bike Tours will hold and use some of the Customer’s personal information in order to perform this contract with the Customer. From time to time, Lemonrock Bike Tours may make the Customer’s personal information available to statutory authorities, however your details will not be released to third parties without your prior opt in consent. Governing Law Court of jurisdiction is Republic of Ireland. At the time of booking a tour, a deposit of €500 per person must be paid. Deposits are refundable only if the cancellation is made before three months of the tour commencement date, less any non-refundable outlays paid by Lemonrock for your tour. The balance of the tour price must be paid no later than 30 days before the tour commencement date. If the balance of the tour price is not paid by the required date, Lemonrock Bike Tours may cancel the tour and retain the deposit. Once a tour has commenced, no refund will be made if the customer curtails the tour or, for any other reason, does not complete the tour. The customer may request amendments to the tour and Lemonrock Bike Tours will use its reasonable efforts to accommodate such requests and will inform the customer of any additional costs or other changes to the tour which are required. Any such costs will be paid by the customer before the commencement of the tour. All accommodation provided will be provided in accordance with the tour proposal made by Lemonrock Bike Tours to the customer and all other services and tour information will be set out in that proposal. From time to time, Lemonrock Bike Tours may change hotel locations due to unforeseen circumstances however we will use hotels of similar quality. Lemonrock Bike Tours will not be responsible or liable where aspects of the tour are not available due to the acts of its suppliers or due to mechanical breakdown or adverse weather conditions. Lemonrock Bike Tours will use its reasonable endeavours to ensure that the tour is provided in accordance with the tour proposal. Circumstances may occur which are beyond its control whereby this is not possible. Such circumstances may include (but are not limited to) war, threat of war, civil unrest, industrial dispute, unavoidable technical issues with transport, closure of ports, airports or other transport infrastructure, terrorism, fire, volcanic activity, flood or other adverse weather and natural or nuclear disaster. In the event of the occurrence of such circumstances no refund or compensation will be payable, and the tour may be cancelled or curtailed. Customers will be responsible for their own costs including meals, accommodation and transportation. Lemonrock Bike Tours or its agents will not be liable for any personal injury, death or illness howsoever caused. 26.2 Customers following guided tours must ride at their own pace and not attempt to follow the group or tour guide such that the Customer is riding outside of his/her capabilities. 26.3 Customers must obey the speed limits and at all times follow their own judgement as to safe riding route. 26.4 Customers and their pillion passengers riding on our tours agree that they are doing so entirely at their own risk and they and their assignees will not take any claim against Lemonrock Bike Tours in respect of injury, death, loss or damage. Lemonrock Bike Tours’s liability for loss, damage or other financial penalty due to its acts will be limited to the tour price. Lemonrock Bike Tours and the customer accept that communications via email will be accepted by both parties as binding where agreement is indicated. These terms and conditions are subject to the Law of Republic of Ireland and the sole and exclusive jurisdiction of the Irish Courts. You must read through the Terms of Service, before you can click on I agree! Please confirm your agreement for Lemonrock to store these details for the purpose of booking your tour. We may send you occasional emails, from which you can also unsubscribe. You may request at any time for us to delete your contact details from our system. We do not share your data with any third parties.